Seminars selling FAST - Get your spot TODAY! This is YOUR chance to get up close and personal with top winemakers from around the globe. 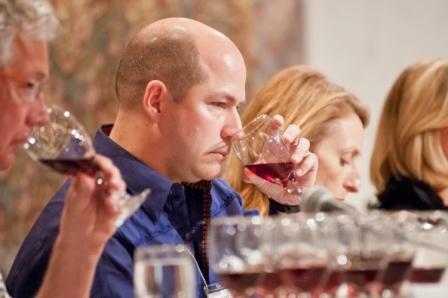 Each seminar is led by 6 celebrity winemakers. Learn about the different varieties, growing regions, trends and characteristics of each wine from the experts themselves! "A World of White" and "Big, Red and Beautiful"
We suggest you buy soon, spaces are limited and close to selling out!!! How many times have you invited friends over for dinner and you turn to those archaic food/wine rules where you can only serve a red wine with red meat or a white wine with seafood? And while you and your guests stand around the kitchen munching on various appetizers prior to dinner, you still pour the same wine that you plan to serve with the meal. I'm here to tell you it doesn't have to be that way and NO you don't have to go to culinary school to figure it all out!! All you need to do to start learning is to attend wine dinners where several courses are served, each paired with a particular wine; and more importantly where both the chef and the winemakers are present to explain why each course gratifies your palate. The best part is that don't have to travel to "wine country" to experience these winemaker events, because "wine country" is coming to Sarasota and Manatee county restaurants on Jan. 25 and 26 as part of the Forks & Corks Food & Wine Festival hosted by the Sarasota-Manatee Originals. This weekend, there will be more than a dozen opportunities to rub shoulders with winemakers from a variety of wine regions around the world at many of the best local restaurants, providing chefs the opportunity to showcase their food and wine pairings. It should be obvious when one considers the different wine regions worldwide represented at these dinners that each of them will offer quite different and unique food and wine pairings. For example: Ophelia's on the Bay in Siesta Key will highlight wines from Keenan Winery, which are produced from intense Spring Mountain fruit in Napa Valley, Calif., and Mercer Estates which produces wines from grapes grown in two very distinct sub-regions of Columbia Valley, Wash., -- Horse Heaven Hills and Yakima Valley -- each of which grow the same varietals with different flavors. The Sandbar on Anna Maria Island will be pairing wines from local product Seth Cripe of Lola Wines who produces Pinot Noir, Chardonnay and Riesling from Sonoma Coast and Russian River Valley fruit along with Bodega Rancho, which is known for producing cool-climate Syrahs from Sonoma County, Calif.
Michael's on East in Sarasota will showcase wines from two of France's more famous wine regions: Domaine Ehrhart of Alsace -- a region known for Riesling, Gewürztraminer and Pinot Gris -- as well as Maison Bertrand Ambroise, which produces excellent offerings of Chardonnay and Pinot Noir from Burgundy. On the other hand, the Polo Grill and Bar in Lakewood Ranch will have a number of different food stations throughout the restaurant which can be paired with wines from more than nine different wineries in different regions throughout California and Tuscany, Italy. If you take a few moments to read the label of the wine that you just opened, most likely you will learn that it is a blend of several different varietals. Just talk to a winemaker such as Anthony Bell and you will quickly discern that blending wine is an art. Bell Wine Cellars is just one of many wineries from around the world attending the sixth annual Forks & Corks Food & Wine Festival, Jan. 25-28 in Sarasota. The festival is hosted by the Sarasota-Manatee Originals and proceeds benefit the John and Mable Ringling Museum of Art and the American Red Cross. Tickets for Grand Tasting Sold Out in Record Time! Tickets for The Grand Tasting Sold Out in Record Time! The Sarasota-Manatee Originals sold 110 VIP tickets in under an hour and 1,250 general admission tickets in three hours and 50 minutes!! This four-day culinary celebration, January 25-28, 2013, brings together celebrated regional chefs, world-renowned vintners and brewmasters, and industry insiders. (Sarasota, Florida) Tickets for The Grand Tasting, the anchor event of the Forks & Corks Food & Wine Festival, sold out in record time yesterday. According to Kate Atkin, executive director of the presenting organization, The Sarasota-Manatee Originals, 110 VIP tickets sold out within an hour and 1,250 general admission tickets sold out in three hours and 50 minutes after the ticket sale opened at noon on November 12. "This is absolutely unprecedented," says Atkin. "We knew tickets would go fast—but we had no idea they'd go this fast. Last year, we sold out in eight days, which was still excellent—but this was just off the wall. This is what sets us apart from all other regional food and wine festivals. We even had calls and emails from overseas; people were desperate for tickets. Our phone was ringing off the hook all day!" Atkin says that tickets for Forks & Corks University's food and wine and seminars (January 26) are still available. The full-day seminar, “A World of White” and “Big, Red and Beautiful,” featuring boutique wines from France, New Zealand, Italy and California, is 9:30 a.m.-2:30 p.m., at Michael's on East Ballroom. Tickets are $150 (plus service charge) and include a four-course gourmet luncheon with wine pairings. A half-day seminar, “California Road Show,” featuring white wines from select California winemakers, is 9:30 a.m.-1 p.m. at Michael's Wine Cellar. Tickets are $75 (plus service charges) and include a four-course gourmet luncheon with wine pairings. Tickets can only be purchased online at www.dineoriginal.com/forksandcorks. Presented by The Sarasota-Manatee Originals (SMO), the four-day culinary festival features various winemaker events at area restaurants and shops (January 25, 26); Forks & Corks University's food and wine and seminars (January 26) in Michael’s on East's Wine Cellar and Ballroom; and The Grand Tasting (January 27), in the courtyard of The John and Mable Ringling Museum of Art. For information and tickets, visit www.dineoriginal.com/forksandcorks. Tickets for The Grand Tasting and Forks & Corks University Go On Sale November 12! Presented by The Sarasota-Manatee Originals, this four-day culinary celebration, January 25-28, 2013, brings together celebrated regional chefs, world-renowned vintners and brewmasters, and industry insiders. (Sarasota, Florida) Tickets go on sale November 12, 2012, for the much anticipated sixth annual Forks & Corks Food & Wine Festival, January 25-28, 2013. 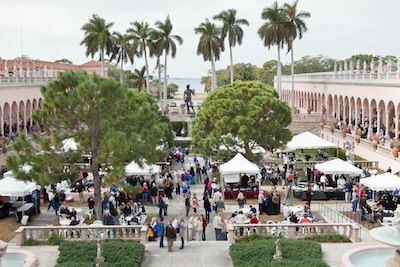 Presented by The Sarasota-Manatee Originals (SMO), the four-day culinary festival features the anchor event, The Grand Tasting (January 27), in the courtyard of The John and Mable Ringling Museum of Art; Forks & Corks University's food and wine and seminars (January 26) in Michael’s Wine Cellar and Ballroom; and various winemaker events at area restaurants (January 25, 26). 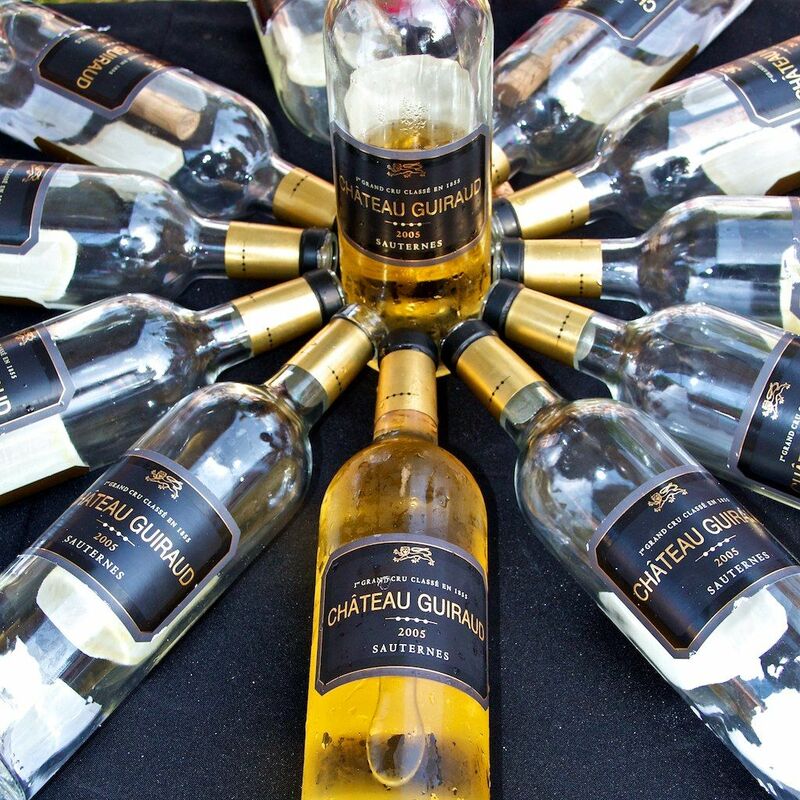 Tickets for the Grand Tasting and Forks & Corks University can only be purchased online. The Grand Tasting tickets are $85 (plus service charge) for general admission; $150 (plus service charge) for VIP admission. Tickets include free admission to the museum’s art galleries on the day of the event. 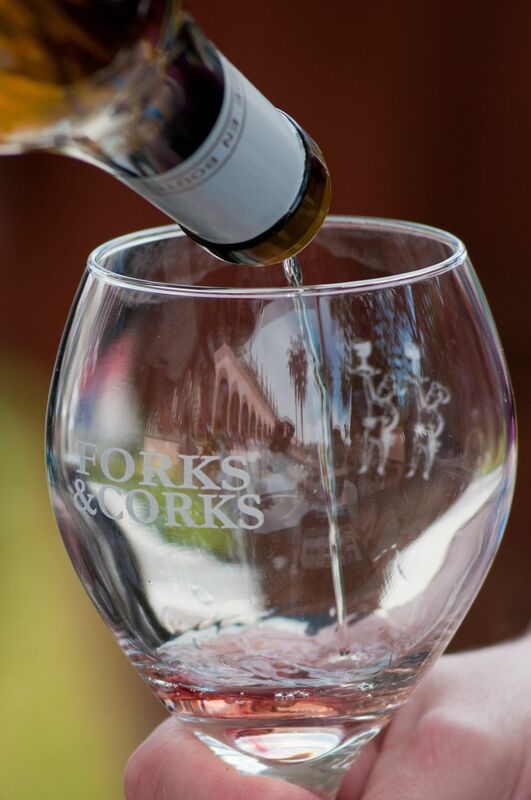 Forks & Corks University tickets are $125 (plus service charge) for the full-day session; $75 (plus service charge) for the half-day session. A four-course gourmet lunch prepared by top Originals member restaurants is included with Forks & Corks University ticket price. For information and tickets, visit www.dineoriginal.com/forksandcorks. 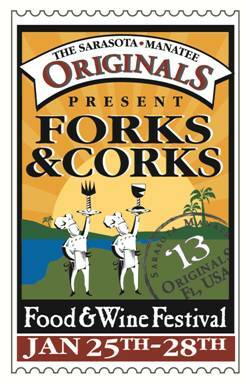 "As Southwest Florida's premier wine and food festival, Forks & Corks is attracting people from around the country," says Kate Atkin, executive director of SMO. "We recommend that people buy their tickets early because we sold out a week after tickets went on sale last year. We predict we'll sell even faster this year—in the first three days. So, buy your tickets as soon as you can. They make great holiday gifts!"